I took a screenshot because stuff like this has a way of mysteriously changing. 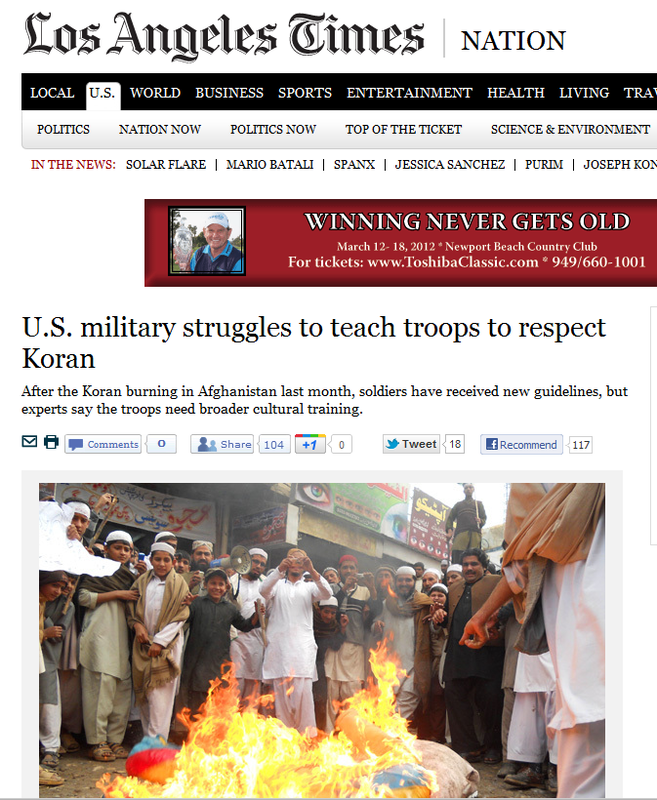 Stop and think about that: Obama is demanding that troops be indoctrinated to respect the Koran even as the same Obama is demanding that Catholics be forced to repudiate their own religious tradition that had endured for one-thousand five-hundred years prior to the coming of the first demon possessed Commander-in-Chief. Imagine a world in which US troops were ordered to sit down by their command structures and taught to start respecting the Holy Bible. And then imagine how the hypocrite left would react to such a world. Earlier this month I wrote an article about ObamaDay at the public schools, in which Barack Obama gave a speech and the Department of Education provided an ideological lesson plan to give to teachers courtesy of the Obama White House. Shortly after I wrote another one to shout back at the left who thought conservatives had gone way over the top by pointing out that Democrats had literally tried to criminalize a similar speech George H.W. Bush gave. I tell you what. I was utterly wrong. I didn’t know the TENTH of how blatantly evil the left was when it came to deliberately indoctrinating public school children. This is some of what children are being told to sing in public schools. I mean, as a child I was taught to sing, “red and yellow black and white, they are precious in His sight.” We were singing about Jesus, the Messiah. The Son of God. Now children who could NEVER be taught to sing “Jesus Loves the Little Children” are being brainwashed to sing praise hymns to Barack Obama. These songs were sung by the children in “honor” of black history month. Government union teachers today are more than capable of using ANYTHING to indoctrinate their students into radical leftist politics and flat-out Obama worship. Another effort by the radical leftwing and George Soros-supported Tides Foundation has received wide viewing from children in public schools. It is blatant ideological leftism. Capitalism=bad and socialism=good. There is a video called the Story of Stuf, that is being showed in schools across the country.You can watch it here. http://www.youtube.com/watch?v=gLBE5QAYXp8&feature=player_embedded. The problem with this video, is that it was paid for by the George Soros funded Tides Foundation and the Host Annie Leonard is a former Green Peace employee and has worked on several environmental issues. The problem with the video is that it is filled with lies and misrepresentations of the facts. Here is a four part video that debunks the Story of Stuff, and many of its outrageous claims. SOS Critique 1, SOS Critique 2, SOS Critique 3, SOS Critique 4. Please watch all 4. There was another video project called “I pledge” that sought to link “positive change” with the person of Barack Obama shown in public schools. During the campaign public school teachers were certainly out to brainwash kids under their care. It’s not just pro-left and pro-Obama indoctrination. Children are being taught to hate conservatives and Republicans. This isn’t just frightening. It is a moral outrage. Anyone on the left who wants to try to sell the message that our schools aren’t bastions of liberal political activism are just wrong. Not to mention evil.